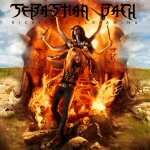 RockUnitedReviews: Sebastian BACH: "Kicking & Screaming"
Sebastian Bach hasn't been the most profilic recording artist since leaving Skid Row in 1996. This one is his second studio album of original songs, following "Angel Down" (2007). That album had its' moments, especially the ballads were something quite special. "Kicking & Screaming" has its' moments too, but I'm afraid they more "that's pretty good" moments than the kind of moments that will make you go "WHOA! Great!". "Dance On Your Grave" is a heavier track, but also one of the most boring ones of the album. The chorus might be drippin' with attitude, but it doesn't work for me at all. The bass-driven "Caught In A Dream", has an okay chorus but that's about it, while "As Long As I Got The Music" sounds a bit like a lost track from one of Ozzy's post-eighties albums. Well, Bach's vocals are quite different, but I could imagine Ozzy singing this too. The album's first ballad "I'm Alive" is a decent one, but again I can hear the 90'ies vibe crawling in... the hollering vocals, the blandess and certain chord progressions just make me think of Seattle and flannel shirts. The hard rockin' "Dirty Power" and "Live The Life" are fairly unremarkable, and the balladic "Dream Forever" doesn't win me over either. It builds up nicely to a chorus, but the chorus itself doesn't cut it. "One Good Reason" is another attitude-fuelled track with Bach spitting out the lyrics with conviction, but it doesn't save it from being merely "okay". The forgettable and grungy "Lost In The Night" follows, but thankfully the album ends on a positive note with the album's strongest ballad, "Wishin'". It's a timeless, melodic track. This is not the album I was hoping Bach would have delivered. New guitarist Nick Sterling shines on the album as a player, but the songs he has come up with Bach are a bit on the average side. Disappointing.